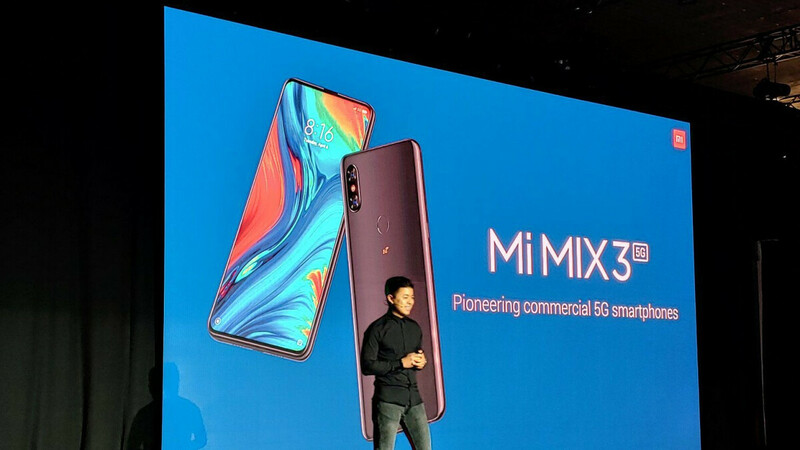 Xiaomi is one of the first companies to hold a glamorous launch event in Barcelona for the 2019 Mobile World Congress, and as suspected for quite some time now, a 5G-enabled Mi Mix 3 variant is taking center stage. Even though you're unlikely to be able to buy this bad boy in the Western Hemisphere anytime soon, let alone take advantage of a next-generation 5G network, the world's fourth-largest mobile device vendor is keen on planting a flag, claiming to pioneer "commercial 5G smartphones." Unlike the "regular", 4G LTE-limited Xiaomi Mi Mix 3 unveiled a few months back, this 5G-equipped model naturally packs a 7nm-based Qualcomm Snapdragon 855 processor with a separate X50 modem. That's not currently found on many handsets (not even in China), but soon enough, it will be essentially ubiquitous for the next wave of Android high-enders. The slide-out design of the Mi Mix 3 5G hides 24 + 2MP dual front-facing cameras with AI live selfie video bokeh effects, just like on the 4G-only configuration. In fact, apart from a beefed-up chipset, the 5G-enabled variant doesn't bring a lot of upgrades to the table compared to its humbler sibling. That's perfectly fine, of course, considering the beautiful 6.39-inch AMOLED display in tow here, as well as all the other state-of-the-art specifications. We're talking up to 10 gigs of RAM, 128 gigs of internal storage space (to start with), and just so you don't need to worry about the Snapdragon 855 SoC running too hot during your intensive gaming sessions or while you download stuff at crazy new cellular speeds, you also get a dedicated "hybrid" cooling system capable of sustaining your handset's "peak performance." By the way, Xiaomi has massive expectations in terms of 5G capabilities, and to demonstrate its new phone is just about ready for primetime, the company made its first 5G video call on the Barcelona stage. Thanks to the magnetic slider construction, Xiaomi is able to tout an impressive 93.4 percent screen-to-body ratio. That body, by the way, is beautifully wrapped in ceramic rather than the fragile glass that backs most other flagship phones right now. The superior material curves around all four sides of the phone, with a robust aluminum frame crucially contributing to an ultra-premium build. Unfortunately, there's no word on the dimensions and weight of the Xiaomi Mi Mix 3 5G, which makes us a little worried. After all, the 4G version was already a tad bulky, at 218 grams. On the decidedly bright side of things, the upgraded handset's recommended price point doesn't feel as prohibitive as you might expect, starting at 599 Euro, although mum's the word on how much memory and storage you get for that reasonable chunk of cash. That would likely translate into just around $600 were the Xiaomi Mi Mix 3 5G to ever come to the US, which once again is sadly not the case based on what we know and can reasonably assume. To keep retail costs low, the company didn't exactly equip this phone with the best cameras available. You only get two 12MP imaging sensors on the back of the Mi Mix 3 5G (as on the Mi Mix 3 4G), combining wide-angle lens and telephoto technology, compared to the three rear-facing shooters of the Mi 9, for example, which total a whopping 76 megapixels. All in all, the balance between affordability and ultra-high-end features feels pretty much perfect, and you don't even have to wait that long to buy the Mi Mix 3 5G... in unnamed markets around the world. The first round of availability is scheduled for May. The biggest problem with this phone is loose slider construction. You will hear a sound when tapping on the top part of the phone. And it is really dissapointing fact. If not a poor slider construction I would get a regular Mi Mix 3. Have you been to a xiaomi store? A_A_A is right, I had the device before and the easy sliding mechanism can be a disaster if it keeps sliding inside your spacious bag. The deal breaker for me buying mi mix 3 is the heavy feel with long use. Just because the internet say it's ok, it doesn't mean that you will not bother checking the real thing. "Have you been to a xiaomi store?" Yes i have and both of your are wrong. The sound that A_A_A hear when tapping on the top part of the phone is because there's a gap between the body and the screen but that doesn't mean it has poor construction its their design choice to avoid dirrect rubbing between 2 part of the phone. I can understand if both of you don't like the phone because it makes weird noises when you tapping on the top part of the phone or because it's to heavy for you. But both of you must be ignor@nt if you think it has poor construction Just because your imagination. I noticed they've increased the battery to 3800mah. I wonder how much more juice that 5G modem takes over 4G? Yes, that's right. Noise when tapping on top and bottom of the screen. It completely ruins imression and definitely a deal breaker. I hope Xiaomi realises how badly such "imperfections" spoil their products and turn off potential customers. A 5G phone with no notch and almost no chin at 600 EUR ? Now that's something ! Good work, Xiaomi ! no that stupid ceramic again..